A second innovative portable HomeBiogas Plant appears to be achieving the funding needed, and this time it will be a portable anaerobic digestion plant. It is astonishing the extent to which that the public will spend money on crowdfunding websites like IndieGigo, which claim 15 million visits monthly. It was at first understandable that web visitors might buy into the development of a new game, or useful gadget for the home, or personal use, on the basis that as a crowdfunding contributor you will be given an early copy of the product, and maybe even without further payment. But, crowdfunded AD plant projects are unlikely to be bought by each one their funding partners, so the benefits are much less clear, and the time between paying out and gaining any benefit must be long for AD projects. And, yet there is the HORSE project below, and the “HomeBiogasLTD” HomeBiogas Plant (domestic biogas unit) described below that. The HomeBiogas Plant promoter seems to be gaining the funds they seek, very successfully. See the Crowd Funding page at Kickstarter here. What do we do with our food waste? It’s become the issue du jour lately as environmentalists, policy makers, and even chefs and restaurateurs take into account the fact that 40% of the food we produce goes to waste. If food’s still edible, than we want to figure out ways to get it to people who will eat it. If not, we want to figure out how to best recycle it… without creating further environmental challenges. The HORSE is a new technology aimed at that latter category of food waste. This portable anaerobic digester provides the means for turning inedible food waste into energy and fertilizer… without transporting it long distances. We wrote about it at sustainablog this week; take a look at our post below, and let us know what you think (or if you contribute to the HORSE Kickstarter campaign). Just over a month ago, I took a look at the argument that a landfill augmented with technology for capturing biogas may be a better alternative for organic wastes than separate pick up and composting/anaerobic digestion. I’m still not totally convinced by this argument (especially when, as a commenter pointed out, the value of the compost created is taken into account). A new [HomeBiogas Plant] technology (or, technically, a new take on an older technology – the anaerobic digester) that just came across my radar could make such arguments irrelevant: the HORSE, or “High-solids Organic-waste Recycling System with Electrical Output” system. This on-site organic waste to energy plant eliminates the need to transport materials to convert them to energy and fertilizer. It will consume 25 tons per year of food scraps, beverages, fat, and paper products. It can create 5,400 gallons per year of liquid fertilizer + up to 37 MW-hrs of raw energy. As renewable gas that’s 125 Million BTU per year (4.3 MW-hrs of this energy is electrical output). The system also has accessory valves for BBQ grills, fire pits, lights, and ovens. How cool is that? Very cool, I’d say! 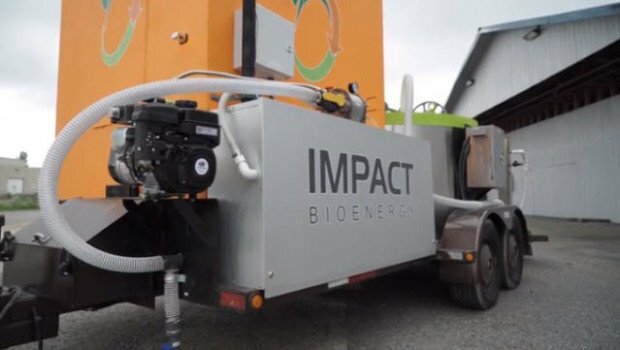 The HORSE is still in its prototype phase: the $30,000 Impact Bioenergy is trying to raise will fund demonstration versions of the machine (hopefully, two of them). While the HORSE costs just over $43,000, the eventual commercial version might be a good investment for the right sized off-grid community – the combination of energy and organic fertilizer seems ideal for these kinds of settings. Take a look at the Kickstarter project video …., and then let us know what you think. And if you’d like to contribute to the cause, don’t wait around – this project only has a few more days left to hit its funding goal. Portable Anaerobic Digestion Unit Ready For Demonstration was originally published on CleanTechnica. We reported on our original crowdfunded AD unit, as below, last autumn. In an effort to provide safe and efficient energy to both rural and urban homes, Tel Aviv based HomeBiogasLTD said of the HomeBiogas Plant, that it has created a self-assembled biogas system that turns kitchen waste and livestock manure into usable cooking gas and liquid fertiliser. Optimised for on and off grid urban and rural families, the system is claimed to produce clean cooking gas for three meals and 10 liters of clean natural liquid fertiliser per day. So, if you have a biogas project, maybe on your farm or for your home food waste, and you need funding to get the project underway, have you considered creating your own crowd funding campaign? on the evidence of these two pioneering crowd funding projects there is evidence that It could be worth a try!